February 24th is National Pancake Day and, in the spirit of celebration, IHOP will be giving out free short stacks of pancakes (3 large pancakes) to all of its customers from 7am to 10pm! 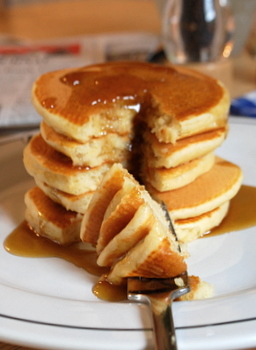 The promotion includes their classic buttermilk pancakes, and there is a limit of one stack per guest. The reason that IHOP holds this promotion is to raise money for the Children’s Miracle Network, a nonprofit that raises money for children’s hospitals around the country. The general idea is that the pancakes are free, so that money (or more, if you feel so inclined) can be donated to the charity. Last year, IHOP was able to raise more than $875,000 through this promotion. No pressure, though. You can always eat the pancakes and support this charity and others in any way you see fit at another time. Noble cause! We all shall shop something to help Childern’s cause. I & my friends will definitely go. i never knew that there is a National Pancake Day all the while..what kind of celebration is that?